The rudders in particular are unique. They have been designed and engineered by project lead Damen Schelde Naval Shipbuilding (DSNS) as free-hanging, full-spade rudders. These deliver optimum hydrodynamic properties but until now were unheard of for an icebreaking vessel of this class, given the forces involved. Other innovative features include the integrated mechanical rudder stoppers, which are located between the rudder blade and (hull) skeg structure rather than on the outside hull due to the latter’s radical design. To deliver all the necessary steering system components from the bridge to the rudder, including hydraulics, control and power systems, while meeting the unprecedented performance requirements, DMC pooled its expertise in this field with that of MacGregor Hatlapa. Working to DMC’s specifications, MacGregor manufactured and supplied the steering gear assemblies and the hydraulic systems that power them based on a highly-customised version of its proven Poseidon series. DMC delivered the rudder system, neck and carrier bearing systems steering gear foundations, electrical system, and the primary steering control system. 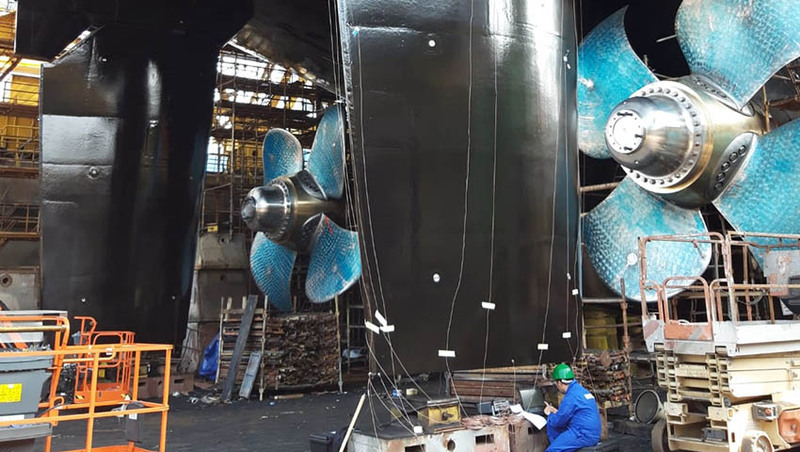 With so many of the systems breaking the boundaries of normal icebreaker design and build, DMC worked closely with Lloyds Register’s polar division throughout the process to ensure that the required standards were established and achieved. The results of this co-operation include rudders that are by far the heaviest per square metre that DMC has ever built and rudder stocks with a diameter of over 1,000 millimetres. This, together with the materials used, made them very challenging to manufacture and install. This joint venture approach was chosen due to DSNS requiring proven technology and a single supplier, yet the specifications were such that no standard products available from DMC and its leading competitors came close to being able to withstand the expected forces. While being only 160 metres in length, the stresses imposed on the hull and its components are equivalent to those found on a normal vessel of 300 metres or more. MacGregor, with an existing product that would deliver the necessary performance after some modifications and a head office just 20 minutes from the DMC engineering department in Hamburg, was the ideal partner. Damen Shipyards Group operates 36 shipbuilding and repair yards, employing 12,000 people worldwide. Damen has delivered more than 6,500 vessels in more than 100 countries and delivers around 175 vessels annually to customers worldwide.